The demonic hordes of the Burning Hells and cold hatred of the Angel of Death are no match against the collective might of the nephalem. 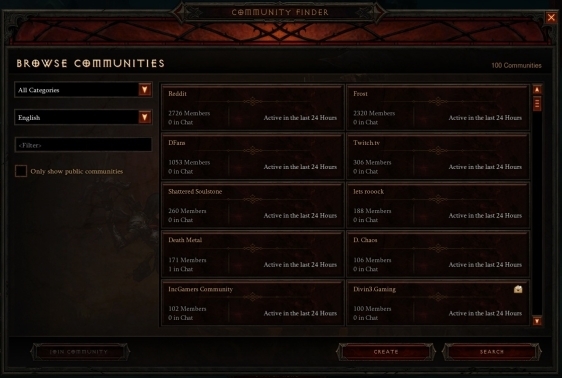 So, to help the heroes of Sanctuary rally their allies, we're adding two new social features to Diablo III in patch 2.0.1: Clans and Communities. With Clans and Communities, we're providing players with easy and practical tools for finding and communicating with like-minded individuals who share a passion for demon slaying, loot hunting, experience farming, as well as other interests. 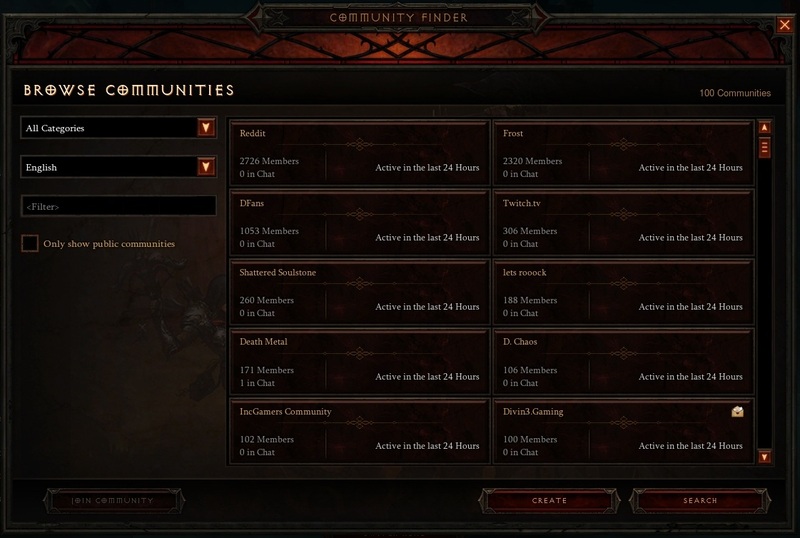 Both Clans and Communities are still in development and currently available for testing on the Patch 2.0.1 PTR and Reaper of Souls Closed Beta. For those of who haven't yet given them a test drive yet, here's a first look. Clans are designed to provide players who share similar interests, gameplay schedules, or goals the ability to band together and form tight-knit groups. They're a great way to communicate with numerous friends at once, organize your play, and generally just keep in touch with those you game with the most. With a member limit of 120 players, clans are intended to be smaller and invitation only. This means that while you can send a request to join a clan, you will not technically become a member unless you are invited or your request to join the clan is accepted. Also, while anyone can create or join a clan, you can only be a member of one clan at any given time. The Clan window can be opened by clicking the "Communities" button located in the lower right-hand corner of the character selection screen, or by using the customizable hotkey (default Shift + O). 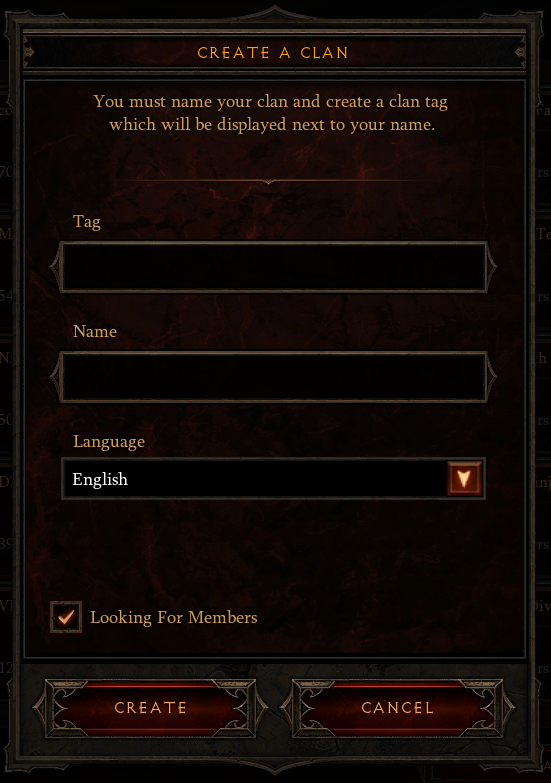 To create a Clan, you will need to provide a Clan Tag (note: this tag will display next to each member's name in-game), a full name for the Clan, and then select a language. You can also indicate whether or not you are looking for members. Note that if you are not looking for members, your Clan will not be displayed in "Find Clan" search results. 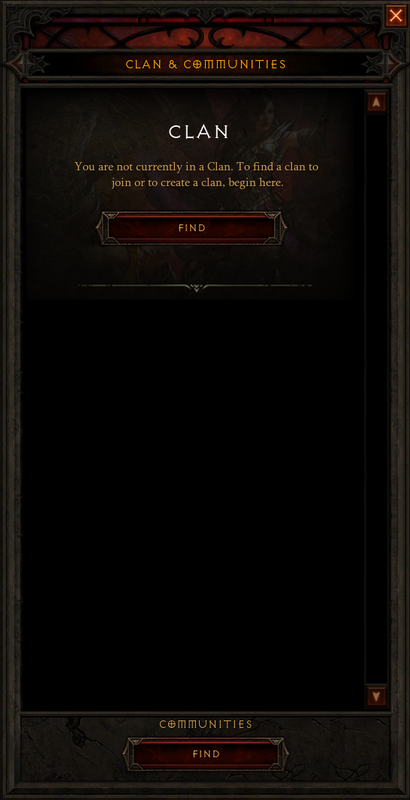 To find and join a Clan, simply open the Communities tab and click "Find" at the top of the window. 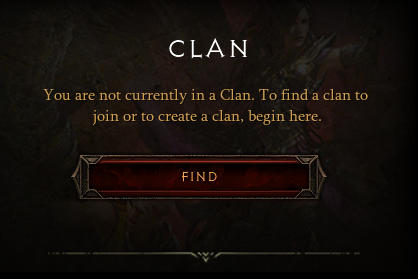 This option will only appear if you are not currently part of a Clan. 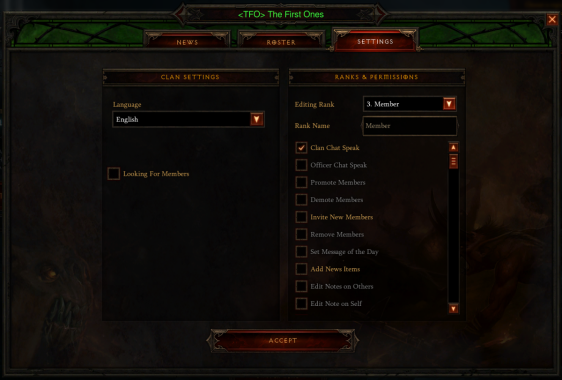 When looking for a Clan to join, you will be able to narrow your search by language and word filters. Selecting a language will limit the search to display only Clans in that language. Similarly, if you add a word or series of words to the filter, only clans with that word in the tag or name will display. Communities are designed to be a place where players can come together for any number of reasons, including playing the same class, frequenting the same fan sites, or living in the same geographical area. They're all about fostering relationships between like-minded people, with a keen focus on socialization. Unlike Clans, Communities are intended to be much larger and more casual. They can be public or private, for example, and support a nearly unlimited number of members. In addition, while you can only join a single Clan, you can be a member of multiple different Communities at the same time. 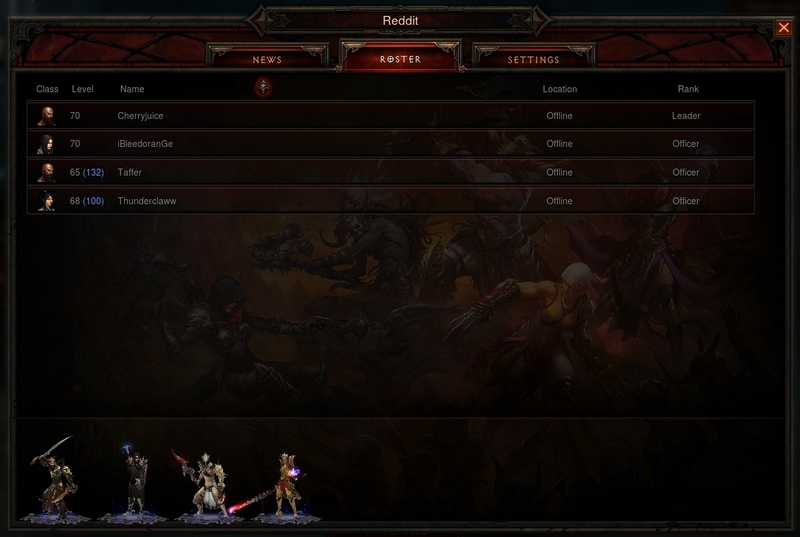 Similar to Clans, the Community window can be accessed by clicking the "Communities" button located in the lower right-hand corner of the character selection screen, or by using the customizable hotkey (default Shift + O). When creating a Community, you will be prompted to pick a language and a category for the Community that best describes it. You will also need to decide if the Community should be public or invite only. ​Searching for a Community works much the same way as searching for a Clan; however, since you can be a member of multiple Communities at once, this option will always be available. To browse for Communities, open the Communities tab and click 'Find" at the bottom of the window. You can narrow your search by selecting a language, or by adding a word filter so that only Communities with that word in the name will be displayed in your search results. You can also limit your search to only display Communities based on a specific category, and you have the option to also only show public Communities. 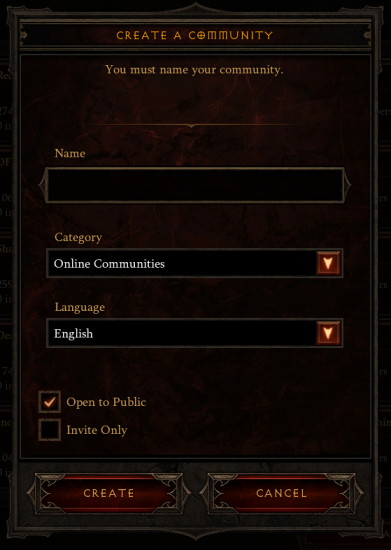 Once you've joined or created a Clan or Community, you will be able to open and browse its respective social window. The Clan and Community window is divided into three tabs: the News, Roster, and Settings. The News tab is the first tab you land on. Here you can find the latest information about your Clan or Community, as well as catch up on the recent activity of other members. You can filter the news you receive in the News tab to include several different types of information. 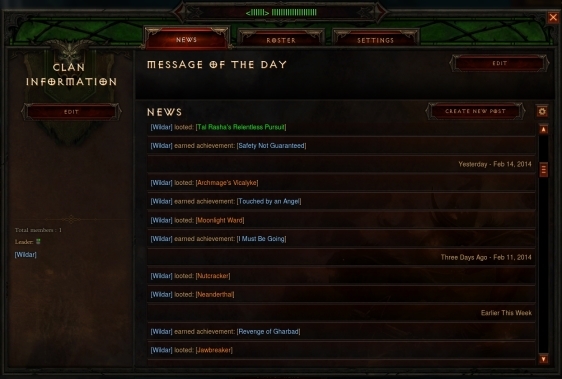 From the News tab (depending on your rank and permission level), you can also edit Clan or Community information, create news posts, and set the Message of the Day that Clan or Community members will see when logging into the game. 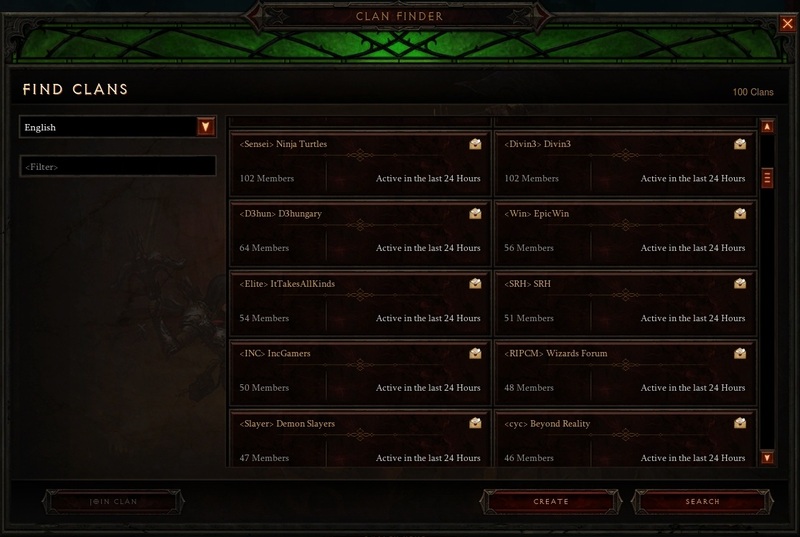 In the Roster tab, you will find a list of all Clan or Community members. The roster will show what heroes each member plays, their location in game, rank, and Achievement points. From here, you can also easily inspect member profiles. The Settings tab is mostly for Clan or Community leaders and officers. From this tab, you can alter the various permissions for each Clan or Community rank, such as the ability to add news, invite members, create the Message of the Day, and join chat channels. You will also be able to change the language of your Clan or Community, whether your Clan is looking for members, or if your Community is public or private. 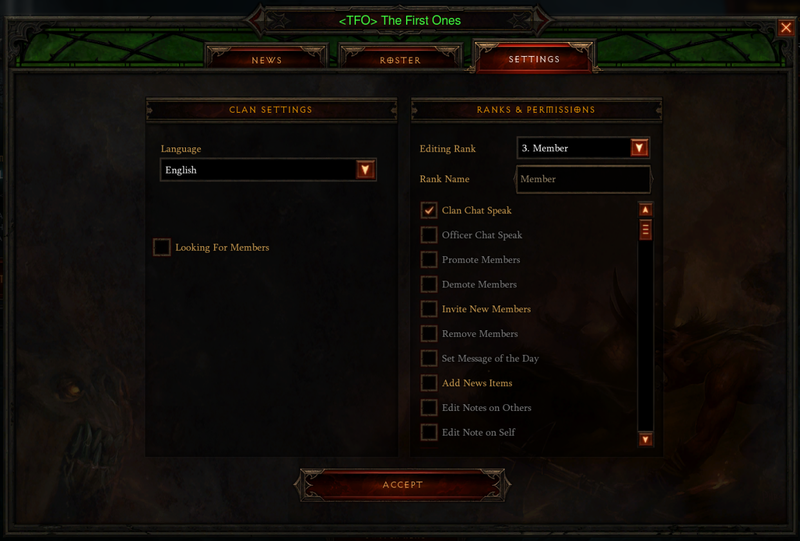 In addition to the News, Roster, and Settings tab, players who join a Clan or Community will gain access to a dedicated chat channel for the Clan and each Community. If you are the leader or an officer of a Clan or a Community, you will also gain access to an Officers Chat specific to that Clan or Community. We hope that the Clans and Communities make it easier for players to have fun with friends—and make new friends!—while playing Diablo III. We look forward to collecting feedback from the brave souls participating in the Reaper of Souls Beta as well as those playing on the PTR for Patch 2.0.1.